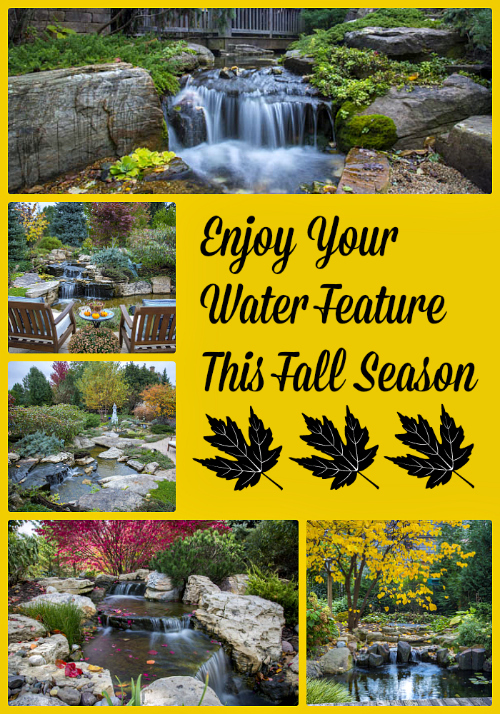 Enjoy Your Water Feature During the Fall Season - Aquascape, Inc. Colorful leaves still cling to November’s trees, creating a vibrant backdrop for ponds and waterfalls. Although spring and summer are typically a pond owner’s favorite seasons, fall is not to be out-done. Riotous color marches across landscapes leaving a streak of breathtaking views. Lucky is the person who enjoys a water feature framed with a lace of autumn colors. A beautiful burning bush (also known as Euonymus alatus) frames the top of a backyard waterfall. Even the fallen leaves look pretty cascading over the waterfall drops. It’s hard to say goodbye to summer when you have a pond or waterfall in your backyard, but Mother Nature is kind by giving us one last show of color before the snow and ice appear, forcing pond fish and other water-loving critters into hibernation. Golden leaves nestle next to water lettuce at the bottom of this Pondless Waterfall. Evergreens hug the waterfall stones helping to soften the rocky edges. The greenery will provide a nice contrast to the white snow in winter, too. Be sure to pull up a chair and enjoy the views during daylight hours while you still can. Ponds and waterfalls seem even more peaceful as the pace winds down outside. And of course, be sure to add pond and waterfall lighting to your water feature so you can enjoy your outdoor living space in the evening hours as the days grow shorter. If you don’t yet have a water feature but would like to enjoy one, consider adding a Fire Fountain to your deck or patio. This fountain embraces the earthy elements of fire and water and is perfect for the fall season.